in performance: Two Standout Debuts in Washington National's "Forza"
“For me, more important than any place we depict onstage is the fact that these characters are all displaced. 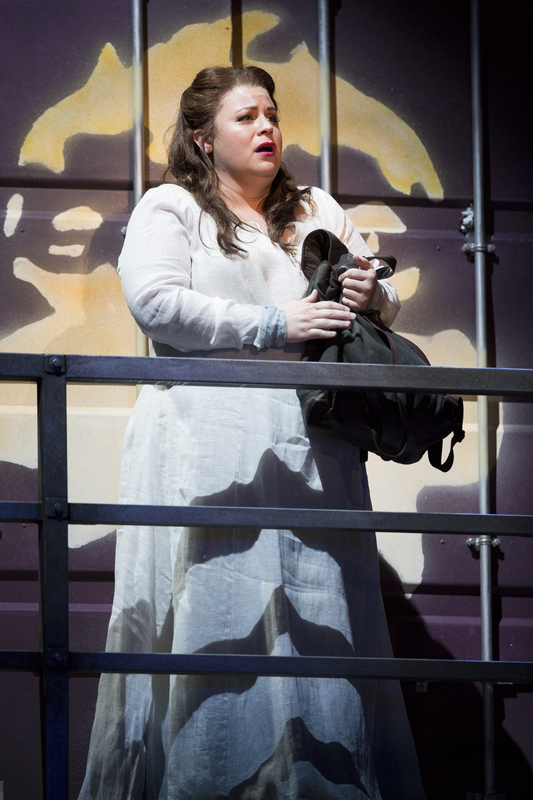 The action ranges all over a chaotic society… They’re [the main characters] like the runaway suburban kids you see in Times Square,” Washington National Opera Artistic Director Francesca Zambello is quoted in the program notes for the current production of Giuseppe Verdi‘s La forza del destino. In production at the Kennedy Center in Washington D.C. from October 12-26, I was fortunate to see the opening night (Oct 18) of the alternate leads featuring Amber Wagner as Donna Leonora, Rafael Dávila as Don Alvaro, and Luca Salsi as Don Carlo. In one of Director Zambello’s most bizarre productions with Washington National yet, the rarely performed Forza is chaotic but the musicality still finds a way to rise above all the stage action. Peter Volpe as the Marchese di Calatrava, although only in the production for a short amount of time, was able to attract the attention of the audience into the “prologue” with his stentorian bass. It seemed as though there might have been some tempo disagreement between Zhang and Dávila in the beginning that worked itself out through the production and settled into his powerful tenor during the Act III “La vita è inferno all’infelice.” Dávila and Salsi shared some compelling and brawny moments in this scene particularly in their “Solenne in quest’ora.” Salsi, occasionally, caricatured his Carlo to a point that read as over-acting. Although he found his most successful moments in the determined “Urna fatale del mio destino.” Enrico Iori as Father Guardino and Valeriano Lanchas as Brother Melitone added counterbalances to this Forza. Lanchas added much-needed levity to Iori’s strict presence physically and vocally. Finally, Robert Baker as Trabuco and Ketevan Kemoklidze as Preziosilla submitted admirably entertaining performances in the confusing and chaotic shipping container landscape of Act II. Zambello’s unique approach to this production is appreciated but not found quite as successful as her other endeavors. However, she created the right elements for the leads to give solid and at times profound performances. I certainly hope that we will see more of Amber Wagner and Xian Zhang at Washington National Opera in future productions. Audiences have one more chance to see Wagner in the October 22nd performance. More information can be found at www.kennedy-center.org/wno.